Not so much the time – although I’m very pleased; only 75 seconds from a PR … but, more pleased in the way I ran it. I know I’ve had a few other good runs in terms of time, but till today, I always felt I was struggling. It wasn’t coming easily, or naturally. Every time I finished a run, I felt like death – a lot of times DURING a run, I felt like death. It was hard, it’s been hard getting motivated knowing/feeling that. Yet, I continued to persevere. Today, I was able to run, and for the first time, I felt incredibly strong, relaxed … I was enjoying it SO much. I was almost tempted to keep going, making it a 12K run. Check out my 4 middle splits – three 4:42 laps, and one 4:44 … WHOA, steady as she goes, lol! I picked up the pace and shaved 8 seconds on kilometer 7, and then I took off 8 more seconds on my final kilometer, finishing my run. I stopped my Garmin (36:58), and I just stood there … I didn’t hunch over, I wasn’t gasping for air … I stood there in amazement at what I had just done. I stood there thinking, I can’t believe I ran hard for 8K, and I feel as if I hadn’t ran at all – I felt THAT good! Not only was this my best run to date, it was my most enjoyable one as well. God, I missed that feeling, loving running! I’m happy it’s back! 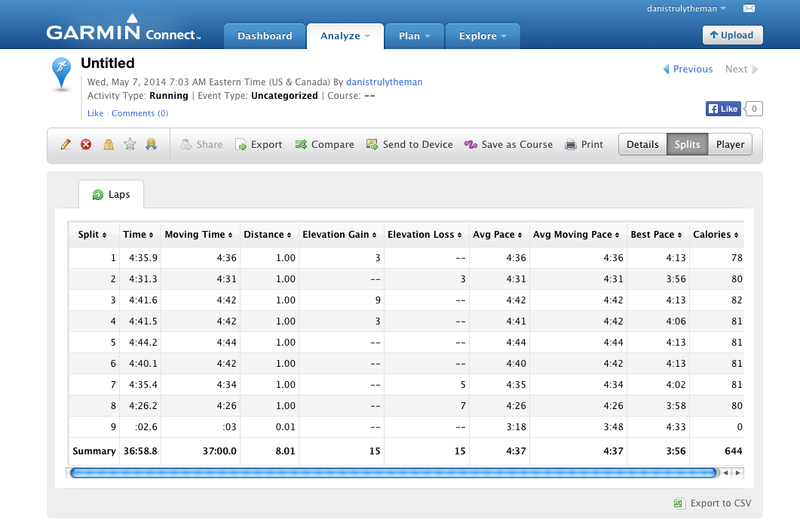 Categories: running | Tags: 8K, Garmin, love running, PR, running | Permalink. I love that feeling of running fast and almost effortless, I keep waiting for the day that every run feels like that!